ASEAN youth leaders in their ethnic costumes celebrate racial harmony at Temasek Club in in Rifle Range Road on July 18, 2016. SINGAPORE – Nearly 500 student leaders from Asean and beyond, as well as the Republic, were reminded on Monday (July 18) of recent terror attacks across the world and how close some of them were to home. The reminder came from the Deputy Speaker of Parliament, Mr Lim Biow Chuan, at the 8th Global Youth Leadership Summit, held at the Temasek Club in Rifle Range Road. He noted that the attack in Puchong, near the Malaysian capital, Kuala Lumpur – near the Malaysian capital, Kuala Lumpur – on June 28 last month was not in some far-away place but barely 400 km away. “That’s very near to us,” he said. He told the student leaders that their best hope to avert disasters was through good leadership, with the goal of serving society. “Whether it is to serve as a student leader, as a business leader or as a political leader, you must want to serve others,” he said. The event was organised by Agape Group Holdings’ Character & Leadership Academy, in conjunction with the National Youth Council’s youth month. 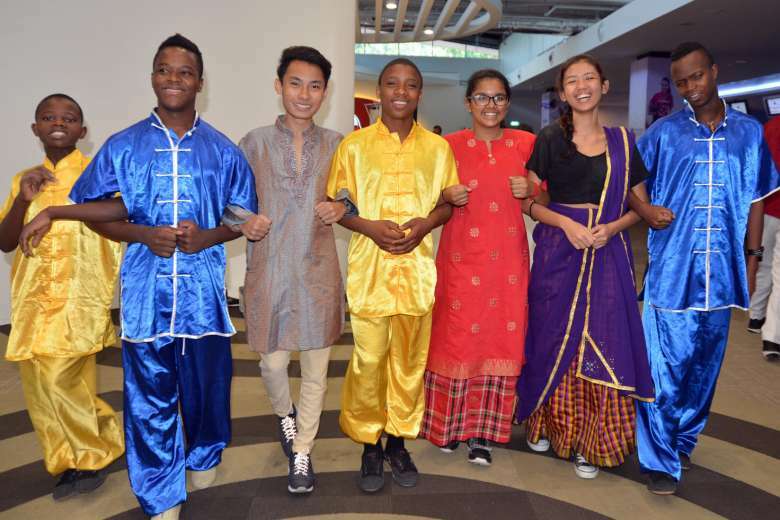 It saw students dressed in ethnic costumes come together to share their experiences in leadership and interracial collaboration. “The summit has allowed me to meet people from different places and understand their culture in a friendly and welcoming environment,” said Siyanda Cedric, 15, from Swaziland. The event also marked Mandela Day , symbolising international racial harmony, on the South African anti-apartheid revolutionary Nelson Mandela’s birthday. Initiated in 2009, the summit is held annually to bring together students of different nationalities with the aim of nurturing global leaders.